There are many aspects of a home that have an impact on the environment. Each one has a different role to play. While no single step offers the solution to maintain the sensitive eco-balance of the earth, taken together in an eco-friendly building these can all help to make a difference. Ensuring occupant health: A house is not just a structure that protects us from the elements, it is a space where people spend most of their lives at home or work. So it is necessary that houses do not harm the occupants in any way. Efficient use of resources: Given the over-exploitation of resources and considering that many are non-renewable, it is necessary to use them efficiently. This is especially true for fossil fuels, mined metals and even for renewable materials like wood which take a long time to grow. Preventing pollution and environmental degradation: Production of the building materials, the construction process, the energy used during occupancy, and disposal of construction waste at the end of a building's life should not pollute or create hazardous waste. Can Tiny Houses Help the Environment? These aims have to be kept in mind while planning, sourcing materials, designing house-plans, construction and during occupancy. The principles have application in renovating old houses and constructing new eco-friendly or green buildings as they are also called. 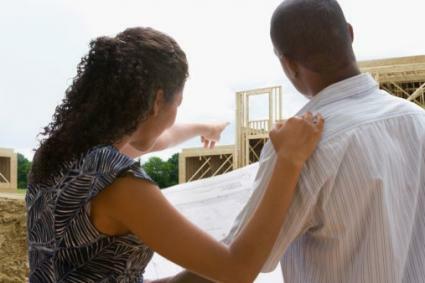 However, it is new construction projects that have the opportunity to maximize benefit from all aspects of the process. Planning an environmentally-friendly house starts with the choice of the most favorable site to build, and deciding the orientation of the house to reduce energy bills for good lighting and to ensure maximum protection from the elements. Geography: The orientation depends on whether the house is situated in the north or south hemisheres. So houses in the northern hemisphere have a south facing house to get maximum sunlight in, while Australian houses can be north facing. Local factors: Location and local climate within a large country like the USA call for fine tuning the above recommendations. So houses in the the north that need more sunlight in the house would be south facing, while houses in the south can be north facing. Similarly, houses in warm Texas can be north facing not south to prevent houses from warming too much. Site: Hills and direction of the slope, or just a large tree nearby that affect the amount of sunlight a place receives would have to be considered to change the general recommendations. House design: The house plan can exploit the movement of sun in accordance with the use of rooms. Early morning sun from the east maybe more welcome in the kitchen and the afternoon sun in the living areas. Resident preference will determine this aspect. Make the most of sunlight through proper orientation of not just the front of the house, but of the different rooms, and placement of windows. The single most factor that decides how eco-friendly a house will be is size. The overall size of the house, rooms. and windows. Overall size: It is not surprising that tiny houses are becoming so popular given their ecological and economic advantages. 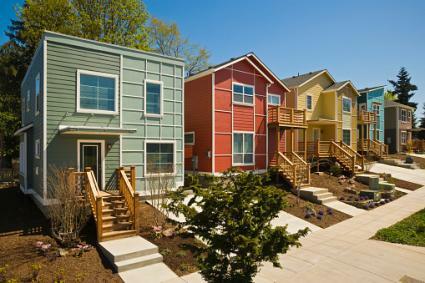 The materials used during construction, and energy use later is dramatically reduced in tiny or small houses. Rooms: Even in normal sized homes, smaller rooms instead of a single large open space can save energy. This does not rule out large spaces in eco-friendly houses, which can be also be enjoyed with enough insulation to cut down energy consumption. Windows: Similarly large (and small) windows are best fitted with double or triple pane glasses to regulate heat movement in or out of the house. Shape of buildings can vary depending on climatic conditions from the usual rectangle or square. Round houses: So round houses are best for hurricane and cyclone prone areas. Earth-sheltered houses: While earth-sheltered houses have been built in a bewildering range of shapes around the world, most of which are partially or completely underground. The roof is one of the most expensive elements in a building and also one of the most important. The type of roof has a great influence on the micro-climate of the house, in addition to its prominent function of sheltering the whole structure. There are many roof styles and roofing materials which can be combined to create optimal conditions, depending on the budget and climatic conditions. Wood shingles: Shingles made of wood are the traditional and another environmentally friendly option. However since the shingles are made from old growth trees and can be expensive. Recycled materials: Recycled wood shingles, or shingles made from recycled materials like rubber, bio-composites, metal, and plastics look attractive, reduce waste and cost less. Living roofs: Green roofs are adopted since they have have good insulation properties. It also provides extra area for gardening when pots and containers are added, increasing living space. All walls have to protect against the elements and provide the right living conditions indoors. Some walls are load-bearing and support the roof or additional floors above, and have to be made of material that are strong like bricks, or stones. Non-loading bearing walls that partition space into rooms can use a greater range of materials, for example light bio-composites. Insulating walls is also one of the best means to achieve energy efficiency especially in a existing building. Good insulation helps to keep in heat in cool areas and heat out in warmer regions. This can also help to save money in the long run. Recycled material: Materials like recycled paper and bio-composites are easy options for insulating new and existing houses. This has the added benefit of providing sound-proofing. 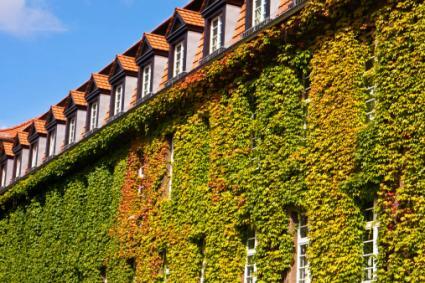 Living walls: Green living walls have creepers and other plants grown on the external face of the building to act as insulators. 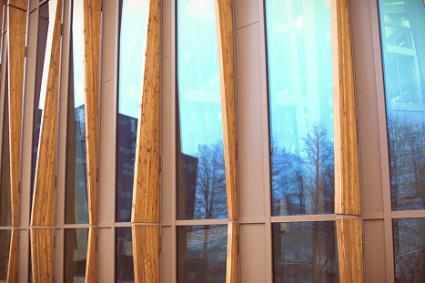 Natural - There is an emphasis on using material that are natural in origin, like wood, straw, or earth. These building materials come from a sustainable source or are created using renewable resources. Timber, for instance, is now available from wood that has been grown and harvested under strict conditions. Buying wood from these sources ensures that deforestation slows and helps to maintain the future of many important forested areas. These are compostable, and create no waste during disposal. Sustainable production: Where a production process is involved as in case of bricks, or glass, care is taken to choose products that are come from processes that are not energy and technology intensive, and are less polluting. Local sources: Locally sourced materials are the optimum choice to reduce carbon emissions and cost due to transport, since many building materials are needed in large quantities. Recycled materials - There are many items used to build a home that can come from recycled sources. Wooden floorboards, or beams, tiles and bricks are all perfect for reuse and can also give a unique feel to a home. Using recycled materials has the dual benefit of keeping rubbish out of landfills while also preserving important virgin resources. Eco-friendly products - As well as building materials, it is important to check that items such as paints, wood preserver and other decorative products are eco-friendly. Some materials are created using harsh chemicals that can damage the environment. 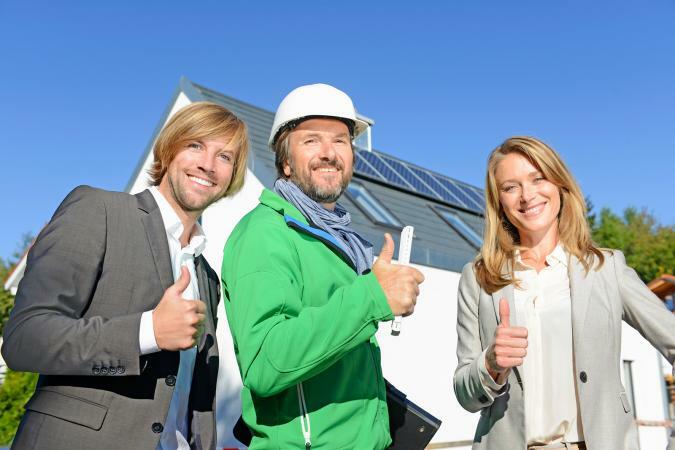 Green home builders can offer plenty of advice about eco-friendly building products. During the actual process of building the amount of energy used depends on the technique and material combination that is selected. Planning: If proper care has been taken during planning, and choice of materials, waste production can be less in quantity and not hazardous. Size becomes a decisive factor here. For example, choosing chemcial-free paints or natural building and roofing materials will not pollute the site or impact people's health while working. Kind of technology: Use of big machines may be inevitable while constructing apartments and large homes. However, in case of smaller buildings employing less technology-intensive methods and a judicious combination of machines and labor can reduce use of energy and fossil fuel driven machine and vehicles during construction. While the construction process is the most resource intensive part of the house, use of water and energy will continue through out the life-cycle of a building when it is occupied. So measures taken to reduce them can be continued -- make selections when buildling to ensure this. Energy and resource efficiency can be improved in new houses, as well as existing houses by easily making small changes. 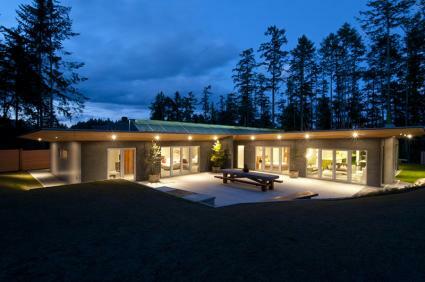 The ideal green home can be planned and designed to be energy efficient. Passive solar design ensures that all the aspects of the house work to reduce the amount of energy needed to heat or cool it. Furthermore, alternative energy sources can be used during occupancy to reduce carbon emissions globally as residential and commercial buildings account for 40% of the total US energy consumption. Other simple measures to help energy efficiency and save energy include fitting eco friendly light bulbs, buying Energy Star electrical appliances and ensuring that heaters have thermostats attached. Use of light and heating can be limited only to rooms that are being used. Water is an important resource and one that often gets overlooked. Being more aware of water usage is an essential part in running a green home. Low flow toilets and front loading washing machines are both interesting alternatives. Low water landscapes instead of grass lawns can be attractive, fun and colorful, as Home Designed Inspired shows. They also require less maintenance making them more interesting. Rainwater harvesting systems can collect rain from roofs and concrete paths in the garden and help to reduce water demand. People in USA should first check if collecting rainwater is legally allowed in their state. 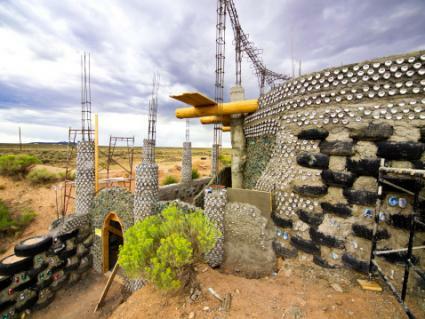 There is no dearth of environmentally friendly buildings, and different examples from around the world reflect the ingenuity of builders in using locally available materials and appropriate technique. While homes might be organized around one particular environmentally-friendly aspect, many incorporate several ideas to create a truly green home. Alex Scott Porter's cottage home is considered a tiny house, which naturally uses fewer materials and energy to build and maintain. Additionally, there are solar panels for energy and a system for catching rainwater to conserve water. The Greenon19 Townhome by Jesse Bornstein Architecture can house five separate families. It has photovolatic solar canopies that help provide energy as well as unique fireplaces designed to both heat and cool each unit. The Wain Road house by NZ Builders Ltd. maximizes the amount of sunlight falling on the house by designing the house with an optimally angled L-shaped house; the massive concrete insulated walls help store heat. This ensures the house remains cool in summer and warm in winter. Juan Luis Martinez Nahuel's Chilean home design is made from multiple recycled materials. The house includes reclaimed glass and wood for flooring from a house and steel beams for frames from an exhibition. Whether you're building a new house or remodeling an old one, you have plenty of options for building that incorporate environmentally-friendly options. Advice from green builders can be an valuable assest to capitalize on benefits from eco-friendly houses.